Every kid knows that if you want your die-cast toy cars to make an impressive jump off a ramp, you need a lot of steep track to build up speed. But Nerf wants to change all that with a new line of blasters that simply fire tiny toy cars directly at a ramp, so you don’t need any track at all. 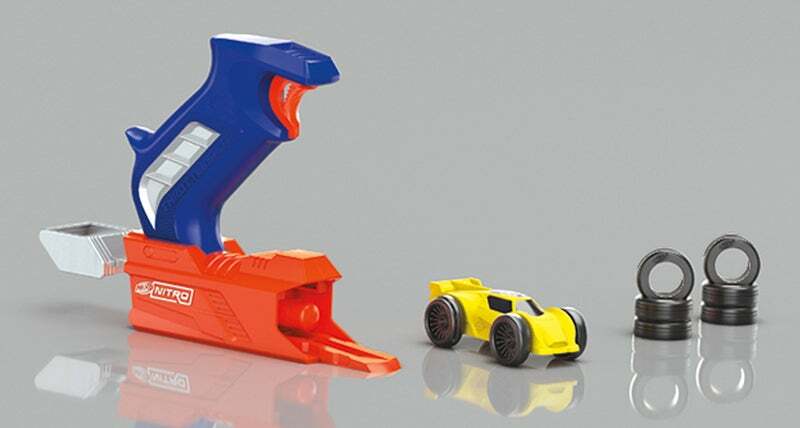 Unlike a steep, towering Hot Wheels track that can only launch tiny toy cars at ramps and obstacles from one direction, Nerf’s new Nitro stunt car blasters can be easily repositioned to send cars racing towards them from any direction, making it easier to re-attempt stunts again and again until you get it perfect. There’s another feature of Nerf’s new Nitro line that parents will appreciate too. The tiny cars are actually made of soft foam so when they come flying off of a ramp they’re not going to crash into walls and furniture like high-speed metal die-cast bullets. 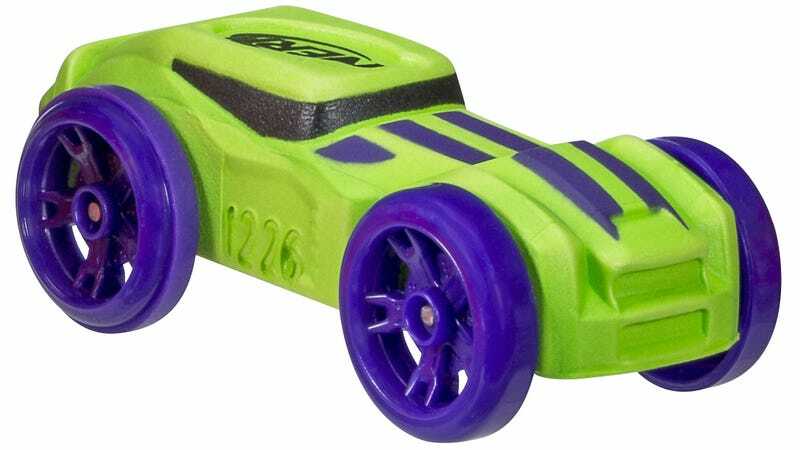 If you can remember all of the destruction you caused (and had to hide from your parents) while playing with your die-cast toy cars when you were younger, as a responsible adult now you’ll probably agree that Nerf’s new foam toy cars and blasters are a clever, and safer, upgrade to a classic toy. 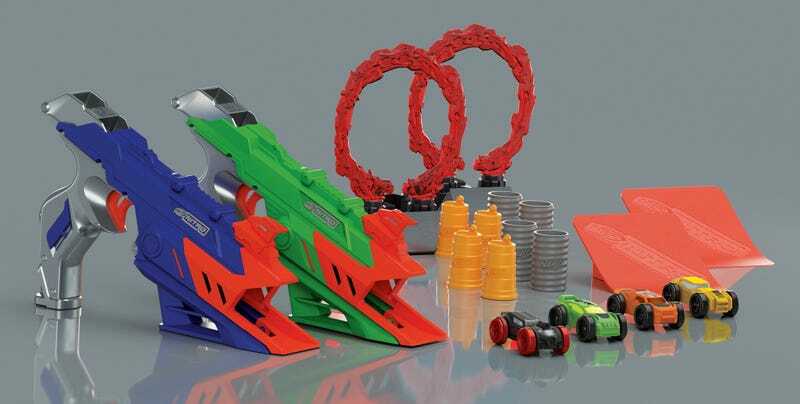 Nerf will be releasing an entire line of Nitro sets available sometime in the Summer later this year, and at the top of the heap is the $50 ( £40) Motofury Rapid Rally which is the only one to include a motorised blaster. The set also includes a long-jump ramp, a high-jump ramp, various obstacles, and nine different Nitro foam cars. Launching tiny cars off ramps is made all the more fun when you get to compete with someone to see whose car flies farther. So the $40 ( £32) Nitro Duelfury Demolition set includes two spring-loaded blasters, two long-jump ramps, two rings of (fake) fire, and four foam cars to launch. If you’re a busy kid with a hectic schedule and minimal time to play, the $30 ( £24) Flashfury Chaos set is the way to go because the included Nitro blaster can actually fire three cars in quick succession with one pull of the trigger. The set includes a long-jump ramp, six Nitro foam cars, and a pop-up target that can be easily reset. If your need for speed is only surpassed by your desire for distance, the $30 ( £24) Nitro Longshot Smash set includes a long-jump ramp, two foam cars, and a small assortment of obstacles you can setup in the landing area to guarantee a spectacular crash. Last and least expensive are the simple Nitro Throttleshot Blitz sets that let you try out Nerf’s new Nitro line for $10 ( £8). The basic set includes an inverted blaster, a single Nitro foam car, and a pair of obstacles, leaving you to build your own ramps and come up with your own stunts.